The European Investment Bank has said it will ramp up financial support for Ireland on a number of fronts to help the country prepare for Brexit. The Government and the EIB have just agreed €300m in soft loans for companies who want to diversify away from the UK market, while senior bank officials have told RTÉ News that preparatory work on the energy pipeline between Ireland and France is being accelerated. Soft loans are loans made on terms favourable to the borrower. It is understood the bank is looking at contingency support both for a no-deal scenario, and the longer term impacts of a negotiated withdrawal of the UK. 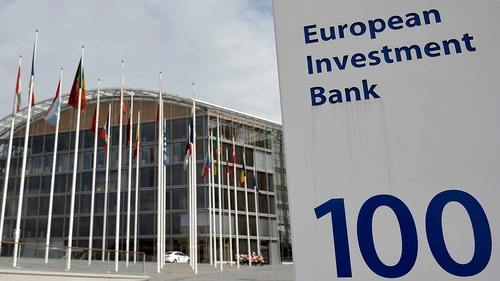 The EIB is the EU's long-term lending institution, set up to support European cohesion policies. The latest tranche of loans follows two previous Brexit-related offerings. The first, at the end of 2016, was a €330m facility designed to help 10,000 Irish farmers cope with currency fluctuations in the wake of the Brexit referendum. Last year, a further €330m in loans were agreed for larger "innovative" companies which required three- to five-year working capital facilities and who were hit by sterling uncertainty. The latest offering, signalled by Minister for Finance Paschal Donohoe during the budget but signed in recent days, is a longer term eight-to-ten-year facility for small and medium enterprises (SMEs) who are seeking to develop specifically new products and markets to reduce their exposure to the UK. The loans are being coordinated through the Strategic Banking Corporation of Ireland (SBCI). Andrew McDowell, a vice-president of the EIB and a former economic advisor to Enda Kenny when he was taoiseach, told RTÉ News the loans would be administered by commercial banks that might normally be reluctant to face such exposure. "We need commercial banks to operate it," he said. "They'll be the ones who generate the loans, but at the end of the day there'll be a guarantee of 80% for loans the banks issue. "It makes it very attractive for the banks. They can get the collateral requirements down, the interest rates down, the capital costs for the banks are much lower. "It's much more profitable for the banks, but we expect them to share that benefit with the ultimate customers." The EIB is also accelerating the planning stage for the so-called Celtic Interconnector, a €1 billion undersea energy link between Ireland and France. Mr McDowell says the risk of a no-deal Brexit has added urgency to the planning process. "There's no overnight risk in terms of north south power supplies, but it clearly becomes a bigger strategic issue for Ireland, to have direct continental access." The bank wants to bring forward the regulatory side of the project from next year to this year because of Brexit. "The regulators in France and Ireland need to be comfortable about this," he says. "That means the regulators need to be comfortable about how much they are willing to do that, how much of the benefit of this goes to Ireland, how much of the benefit goes to France, how much each side should pay for it," he said. The project is expected to be funded by the EIB, Ireland and France, with additional support from the European Commission, as it is part of their long terms energy plans, under the so-called Connecting Europe Facility (CEF). "We would hope - and we met the promoters last week - it will require a level of grant aid from the Commission as well as cheap EIB financing. Initially we've been looking at full appraisal next year but we want to bring that forward to this year," says McDowell. "We want to work together, France, Ireland, the Commission, ourselves, very closely over the next two months to put together a finance package. It is a security of supply issue for Ireland." Mr McDowell says that aside from the security of energy supply issue, and the fears over Brexit, there are significant commercial opportunities for Ireland. Given that both France and Germany are progressively switching away from nuclear and coal to renewable energy, there are opportunities for Irish Sea wind farms to feed directly in to the European power grid via the Celtic Interconnector. The EIB says it has also been providing support to Irish Ferries in their attempts to develop more direct freight routes to the European mainland because of uncertainty over the UK land bridge as a result of Brexit.